Abstract: Anthropocene discourse often describes futures characterized by climate destabilization leading to the extinction of certain species. Often these futures are described using dystopian themes. Yet how might some Indigenous peoples interpret such futures? While similarities are present given Indigenous concern with conserving native species, it is more accurate to claim that indigenous conservationists focus more on sustaining particular plants and animals whose lives are entangled locally, over many generations, in ecological, cultural and economic relationships with human societies. Indigenous peoples learn from, adapt, and put in practice these relationships to address the conservation challenges they face today, especially the environmental destruction of settler colonialism in North America. What is more, the environmental impacts of settler colonialism have made it so that quite a few indigenous peoples in North America are already no longer able to relate locally to many of the plants and animals that are significant to them. In the Anthropocene, then, some indigenous peoples already inhabit what their ancestors would have likely characterized as a dystopian future. So they consider the future from what they believe is already a dystopia. The lecture explores these ideas in relation to case examples from Indigenous conservation. 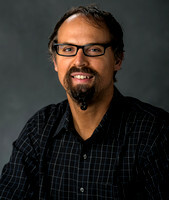 Kyle is Associate Professor of Philosophy and Timnick Chair in the Humanities at Michigan State University. He serves as a faculty affiliate of the American Indian Studies and Environmental Science & Policy programs. His primary research addresses moral and political issues concerning climate policy and Indigenous peoples and the ethics of cooperative relationships between Indigenous peoples and climate science organizations. He is an enrolled member of the Citizen Potawatomi Nation. Kyle is involved in numerous Indigenous climate change organizations, including the Climate and Traditional Knowledges Workgroup, Rising Voices of Indigenous Peoples in Weather and Climate Science and the Sustainable Development Institute of the College of Menominee Nation.